Big news here for users looking for a replacement for InfoPath-based SharePoint forms! Smart List Pro is our bestselling product that allows you to extend the built-in SharePoint forms, turning regular list in real business applications. With tabbed interface, tab and column permissions, advanced validation rules and customizable default values, your forms will never look and work the same. Until now the tab/column permissions were only evaluated on the server, just before loading the form in your browser. Once loaded, the columns would remain in the same state (writable, read-only or hidden) until your saved and re-opened the form. It's ok for most usage scenarios, but sometimes you need a more dynamic form. Consider the following scenario: you are filling out a insurance application form. Based on the type of insurance you filled out on the first tab (car or home), you would like to see car or house details column (no point in filling out VIN for a house or address for a car, is there?). 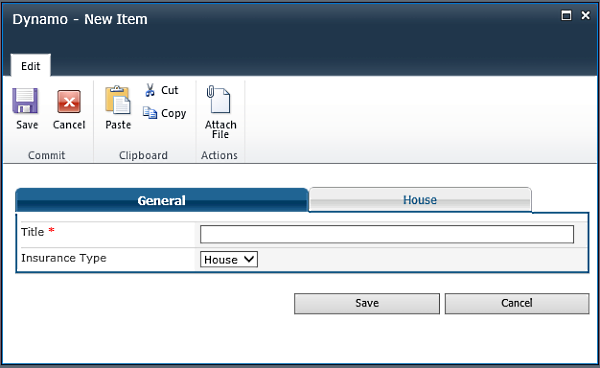 You would place the car details columns on the Car tab and house details column on the House tab. Depending on the value of Insurance Type column, you would want one of the tabs to be shown and another one hidden. With the new dynamic permissions in Smart List Pro it is finally possible! Your permission rules can now be applied on-the-fly, as soon as you update one of the columns used in permission conditions. Columns are then set to write, read-only or hidden immediately, without having to save the form. Some restrictions do apply. Not all column types are supported and if your condition uses functions, it cannot participate either. Conditions that cannot be evaluated dynamically are still evaluated on the server and passed on to the client, they are just not updated as the column values change. Refer to the user guide for more details. The regular server-based mode is still there and it's the default. Note that dynamic permissions are not supported in Smart List Lite.